My family was having one of our biggest gatherings ever. 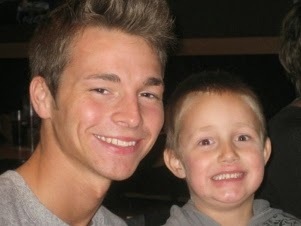 It was the day my nephew Brett turned six years old. But nobody was there to celebrate Brett's birthday. Quite the opposite. We had come together for the "celebration of life" of Brett's 22 year old brother Anthony, who one week earlier was found dead, thousands of miles away in Florida. On the way to the church I showed Brett the key I always wore on a chain, a Key to the City of KCMO that I'd bought on ebay, my most prized possession. It had spent months right next to my heart. I told Brett we were going to send it along with Anthony. Brett asked if he could hold it 'till then. "Of course!" We got to the big, beautiful church early, but not early enough to beat the "Early Birds," those mourners who show up to a funeral extra-extra early and get good seats so as not to miss a single dramatic reaction. As I saw the beautiful and angellic face of the nephew I'd lost, the only thing the Early Birds needed was popcorn as they watched me tearfully and emphatically try to persuade my nephew's stepfather that none of this was actually happening, that none of this was real. There was a tug on my dress. "Don't worry, Aunt Leigh Ann. It just looks like he's sleeping, and besides, he's in Heaven now. It's better than here." That snapped me back to reality, and the Early Birds seemed satisfied as they readied themselves for the next scene. For the remainder of the three hour visitation (which ended too soon), I was given charge of the Birthday Boy. The first thing he wanted was the laminated funeral card that he'd seen in the hands of everyone else there. We went up to the funeral home representative that was giving them out (not associated with the wonderful people of the church, who were angels of mercy) and I asked for a card for Brett. "Adults only," she said, reminding me of a matronly liquor store clerk in the winding-down days of a decades-long career. "You see, today's Brett's birthday!" I told her, "and that's his brother in there. So would you give him one of those cards, please?" "If you want him to have one so bad, give him your own," she suggested, without a trace of warmth or sympathy. Instead I handed her one of my business cards, and told her that if she didn't give Brett a card I would spend the rest of the year telling everyone I could in Kansas City how her family's company treats bereaved child siblings on their birthdays. Hardball. "Here!" she said, and gave me another card. Brett was thrilled with his funeral card as I walked away, scowling at her. Wrong date on the card. Misquoted. Most of the visitation I spent proudly showing off Brett to people I hadn't seen in many years. "This is Anthony's brother Brett. Today's his birthday! He's six today!" I'd tell them, seeing that jolt of sad irony dozens of times. "Today is Brett's day," I kept telling myself. "Make this about Brett," and I tried to keep him amused while the whole time my heart was just being ripped out of my chest because of why we were there. I honestly don't know what I would have done without Brett that day. He kept pulling me back from the worst abyss of my lifetime and I'll be grateful forever. His spirits were good. We looked at pictures. He made me laugh a lot. He loved the Key to Kansas City. "Do you want that key, Brett?" I asked him. "Yeah," he said, "but I want to give it to Anthony." I told him I had another one almost just like it, but older and better. "It's from the 1950s," I said. "From the 1950's? Wow!" All my family loves nostalgia. I promised him he could have the other key. On his sixth birthday, my nephew Brett spent the whole day with everyone he loved saying goodbye forever to his hero big brother. And today he may be the only 9 year old kid in KCMO with his very own Key to the City. I love this. I know it hurt you to do this entry, but it is priceless. Very sad but beautiful story!!! What a strong person!!! Wow. Thank you for that. It brought tears to my eyes. And it made me want to hunt down that funeral home representative and teach her some respect. Leigh Ann, you're a genius.